Jewel Beetle Castiarina deyrollei Photo E Collins Most species feed on nectar, this one is feeding on Bursaria flowers. Photo E Collins Most species feed on nectar, this one is feeding on Bursaria flowers. Pie-dish Beetle Helea castor Photo E Collins A flightless beetle which forages at night. Its common name reflects the "pie-dish" shape of its elytra which are fused. 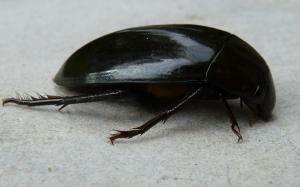 Photo E Collins A flightless beetle which forages at night. Its common name reflects the "pie-dish" shape of its elytra which are fused. Ant Nest Beetle Arthropterus sp Photo E Collins A beetle with remarkable antennae and an association with Bull Ant nests. Photo E Collins A beetle with remarkable antennae and an association with Bull Ant nests. 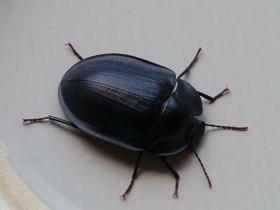 Large Black Water beetle Hydrophilus latilpalpus Photo E Collins One if the largest water beetles. Its larva live in water and prey on other organisms. Photo E Collins One if the largest water beetles. Its larva live in water and prey on other organisms. Jewel Beetles Castiarina sp Photo E Collins These gems are feeding on Pimelia linifolia, Slender Rice-flower. 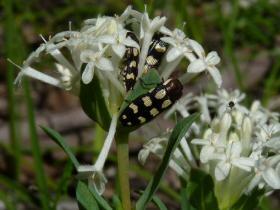 Photo E Collins These gems are feeding on Pimelia linifolia, Slender Rice-flower. Christmas Beetle Anoplognathus sp Photo E Collins Common in summer and a serious pest of eucalypts. Defoliates trees. Photo E Collins Common in summer and a serious pest of eucalypts. Defoliates trees. 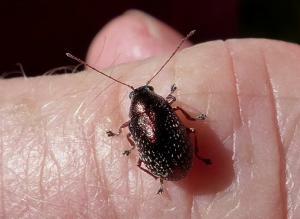 Radar beetle Rhipicera femorata Photo G Johnson DSE Stunning and aptly named beetle photographed at Bonegilla. Thought to predate cicada species. 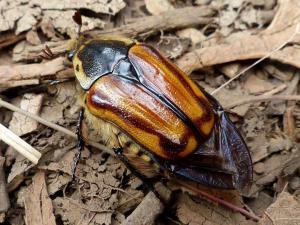 Photo G Johnson DSE Stunning and aptly named beetle photographed at Bonegilla. Thought to predate cicada species. Ant dragging a beetle Photo E Collins The amazing strength of an ant. This beetle carcass is over 1 cm long! Photo E Collins The amazing strength of an ant. This beetle carcass is over 1 cm long! Altica pagana - Metallic Flea Beetle Photo E Collins This view shows the underside features. Photo E Collins This view shows the underside features. Altica pagana Metallic Flea Beetle 2 Photo E Collins Dorsal view showing hairy back. 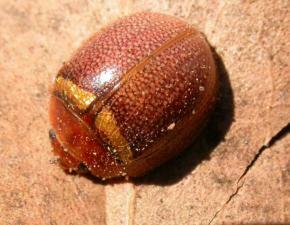 These beetles feed on a variety of flowering plants, chewing holes in the foliage. Photo E Collins Dorsal view showing hairy back. 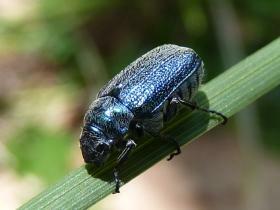 These beetles feed on a variety of flowering plants, chewing holes in the foliage. 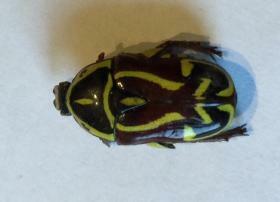 Eupoecila australasiae Fiddler Beetle Photo C Gillman A beautiful beetle. Feed on nectar and pollen and acts a as pollinator. 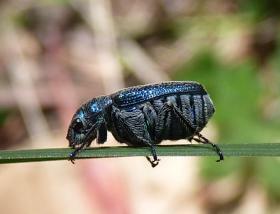 Photo C Gillman A beautiful beetle. Feed on nectar and pollen and acts a as pollinator. Lagria sp Photo N Blair Long-jointed Bark Beetle. Found on foliage. Photo N Blair Long-jointed Bark Beetle. Found on foliage. 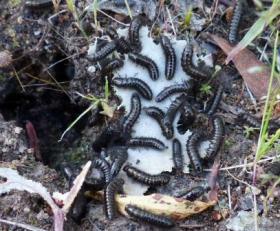 Brown Darkling Beetle larvae Photo N Blair Ecnolagria grandis. Family Tenebrioidae This beetle is golden brown and has a hairy body. Photo N Blair Ecnolagria grandis. Family Tenebrioidae This beetle is golden brown and has a hairy body. Laccopterum macleayi Ground Beetle Photo N Blair A rarely recorded Ground Beetle known only from Mt Pilot, north of Albury and Sydney. 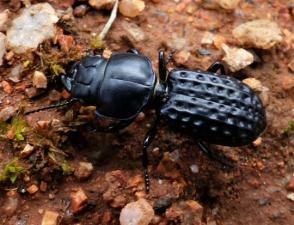 Photo N Blair A rarely recorded Ground Beetle known only from Mt Pilot, north of Albury and Sydney. Lamprima latreillei Stag Beetle Photo E Collins A stunning Golden Green Stag Beetle. Its antennae are comb-like. Their fat white larvae live in decaying wood. 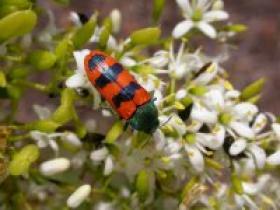 The beetle feeds on the nectar of Acacias and Eucalypts. Photo E Collins A stunning Golden Green Stag Beetle. Its antennae are comb-like. Their fat white larvae live in decaying wood. The beetle feeds on the nectar of Acacias and Eucalypts. Chondropyga gulosa Photo N Blair Cowboy Beetle. An expert flier which makes a buzzing noise as it flies.Note the "antler-like" antennae. Take nectar and pollen. Photo N Blair Cowboy Beetle. 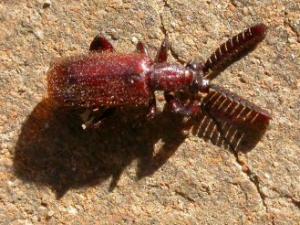 An expert flier which makes a buzzing noise as it flies.Note the "antler-like" antennae. Take nectar and pollen.